Since most of you haven't met me in person, I thought I'd introduce my traveling companion to you -- the good friend who's been with me when I've taken the vast majority of these Montana photos. Everyone, say hello to Miles the Dog. Miles is a Border Collie, rescued from the animal shelter by a friend and then given to me when things didn't work out. He's been my partner in crime since 2003, and we've shared lots of great adventures together. I took this shot of Miles about five years ago, as we explored the winter streets of Virginia City. Today, Miles is an old dog and his health is failing ... but he's still happy, and still a great companion, and still always up for a hike or a roadtrip. What a handsome boy! How old is Miles? I have a Brittany, Molly, who will be eleven in March...just diagnosed with a bad heart. I have a hard time remembering life before she was in it, you know? 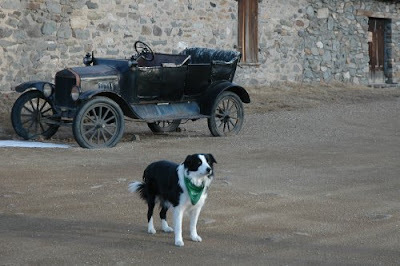 Miles looks like he's aging gracefully, as Border Collies usually do. And so dapper with his kerchief! Thanks for this look "behind the scenes". Since Miles is a shelter dog, I don't know his exact age ... but if the vet's guess is right he's probably about 13 or 14 now. This shot was taken back in early 2005, so he was much more chipper back then. He's definitely a little more ragged these days, and there have been some major health scares lately. He's been with me nearly 24/7 ever since he came to live with me -- even goes into work with me -- so it'll be rough when he's finally not around.